There has been two days worth of smoke surrounding Ballghazi, and now it looks like there might actually be a fire. 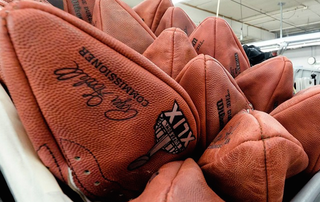 According to ESPN's Chris Mortensen, the NFL's investigation into whether the Patriots deflated footballs during Sunday's AFC Championship Game has found that 11 out of the 12 balls they supplied were underinflated by two pounds per square inch. It may not sound like much, but NFL rules state that all footballs must be filled to between 12.5 and 13.5 pounds per square inch. While the NFL's investigation has seemingly found that something happened—the league declined to comment—Mortensen's report lays out that there are still a lot of unknowns. Chief among those unknowns is how the balls became underinflated, as they are supposed to be inspected by the head referee two hours and fifteen minutes before the game begins and not messed with thereafter. And, if it is found that the Patriots intentionally tampered with the balls, we still don't know what penalty the league will levy upon New England. Every year it seems a ridiculous story rushes in to fill the empty air of the two-week gap before the Super Bowl, but this one might top them all.